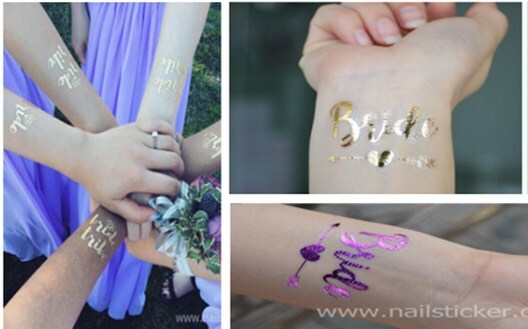 Our new product,wedding tattoo,is on the top selling in the Amazon.Wedding tattoo is originally known as bachelorette tattoo,which is used in the Bachelorette Party where the team bride holds the party to honor the bride-to-be. We have 18 patterns with two colors including golden and purple color.One of the client from Europe ordered 50 pieces on last Friday ,then yesterday he ordered 5000 pieces.Another client from Australia initially just ordered 6 patterns,later he ordered all the patterns.An American client not only purchased our wedding tattoos but also purchased other products related with wedding including crowns,balloons,wine glasses,cupcake toppers and puzzles. Besides running wedding tattoo,there are many other products in our company,Guangdong Nail Sticker Cosmetics Co., Ltd is a professional nail beauty products manufacturer specializing in designing, manufacturing, and distributing full range of decorative/cosmetics sticker such as nail stickers, temporary tattoos, rhinestone stickers, manicure set, holiday/promotional gift sets, make-up and bath products, and fashion accessories.